Some may find this isn't a big deal. 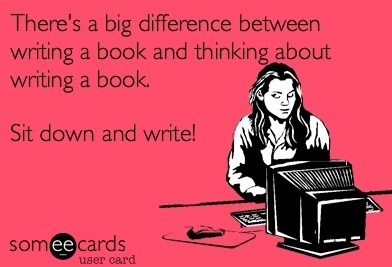 People write books all the time. And that may be true. But it's also true that people try to write books and don't finish. It's really hard to finish. It's hard not to give up, not to get bored or become lazy or get a new shiny idea and run off with it. Some amazingly talented people try to write books. And though they have fans and the means to make a great book. They might have one thing lacking: Discipline. Self-discipline. It seems so simple, yet it's really hard. It's hard to stay on a diet when someone is offering you a delicious, warm, straight-out-of-the-oven-fresh bakes cookie. When I was in school. I met some amazingly talented artists. They were great and interesting, while I was dull and average compared. But I had the motivation to complete all my assignments and, though I wasn't the best. I graduated. Of course most of the talented people did too. But there were those few, whoe if they just FINISHED thier amazing final animation, they would be graduating and getting into studios and makign great things. I may not be that talented in writing, but I have a talent in self-discipline. When I was younger, my gramma didn’t care if I went to school. She was bored, disabled and lonely, so the company would be fine for her. But I went anyways. I made myself go to school. Because if I didn’t, no one else would. Because I wrote it for myself. It seems like such a simple thing. But it's really not. When you do something for yourself, you can brush it off more easily than when you're doing something for others. It's harder to be selfish and take time for yourself and do something that's just for you. You write for yourself first. Oh wow, Congrats! :) It's the best feeling when you accomplish something you've wanted to do for yourself.